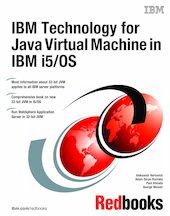 This IBM Redbooks publication gives a broad understanding of a new 32-bit Java Virtual Machine (JVM) in IBM i5/OS. With the arrival of this new JVM, IBM System i platform now comfortably supports Java and WebSphere applications on a wide array of different server models: from entry size boxes to the huge enterprise systems. This book provides in-depth information about setting Java and IBM WebSphere environments with new 32-bit JVM, tuning its performance, and monitoring or troubleshooting its runtime with the new set of tools. Information in this book helps system architects, Java application developers, and system administrators in their work with 32-bit JVM in i5/OS. Important: Despite the fact that this book targets i5/OS implementation, most information in this book applies to all IBM server platforms, where the new 32-bit JVM is supported.